It’s August 1965 and Los Angeles is scorching. Americo Monk, a street-haunting aficionado of graffiti, is frantically trying to return home to the makeshift harbor community (assembled from old shipping containers) where he lives with his girlfriend, Karmann. But this is during the Watts Riots, and although his status as a chronicler of all things underground garners him free passage through the territories fiercely controlled by gangs, his trek is nevertheless diverted. Embarking on an exhilarating, dangerous, and at times paranormal journey, Monk crosses paths with a dizzying array of representatives from Los Angeles subcultures, including Chinese gangsters, graffiti bombers, witches, the Nation of Islam leader Elijah Muhammad, and others. Graffiti Palace is the story of a city transmogrified by the upsurge of its citizens, and Monk is our tour guide, cataloging and preserving the communities that, though surreptitious and unseen, nevertheless formed the backbone of 1960s Los Angeles. With an astounding generosity of imagery and imagination, Graffiti Palace heralds the birth of a major voice in fiction. 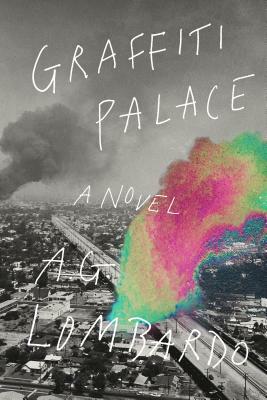 A. G. Lombardo sees the writings on our walls, and with Graffiti Palace he has provided an allegorical paean to a city in revolt.